Miranda Rice led the Gusties with 11 points. 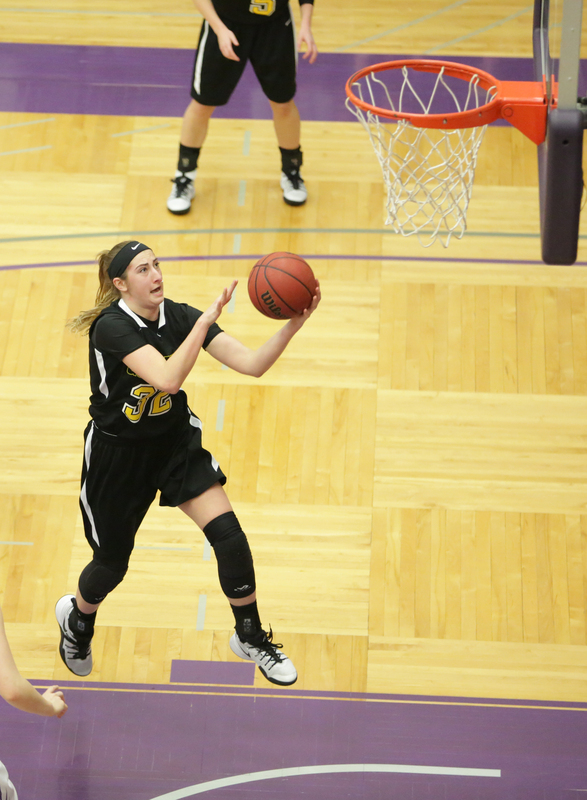 ST. PAUL, Minn. – The Gustavus women’s basketball team fell by a score of 66-49 to the University of St. Thomas Sunday afternoon in the MIAC Playoff Championship game, suffering its second loss of the season to move its record to 25-2 overall. A strong first quarter and efficient shooting performance helped guide the nation’s No. 2-ranked St. Thomas squad to the win over Gustavus as the Tommies grabbed their sixth-straight MIAC Playoff title. St. Thomas began the game on a 6-0 run before the Gusties nailed three-straight three-pointers as the scoreboard read 11-9 St. Thomas, four minutes in. 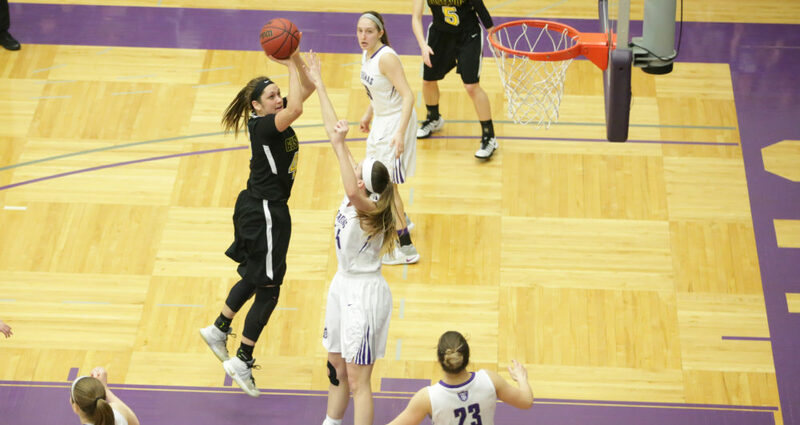 Hannah Howard goes up for two in the MIAC Championship game. Midway through the first quarter, Gustavus posted four three-point field goals. Two from Justine Lee (So., Dawson, Minn.), and one each from Mikayla Miller (Jr., Goodhue, Minn.) and Miranda Rice (Jr., Forest Lake, Minn.). After St. Thomas jumped out to a 30-19 lead in the first 10 minutes, shooting 11-for-13 from the field, Gustavus pushed back to outscore the Tommies 14-9 in the second quarter. The Gusties also held the Tommies to four points in the first 6:45 of the second quarter, and forced six turnovers during that time. The Gusties shot 7-for-27 from the field with a balanced scoring attack in the first half, trailing 39-30 heading into the locker room. Gustavus cut the Tommie lead to four points at the 3:30 mark of the third quarter when Taylor Anderson (So., Rogers, Minn.) hit a three-pointer to set the score at 45-41. Despite several more hopeful runs in the second half, St. Thomas always answered to prove its early lead to be too much. St. Thomas held the Gusties to just three points in the opening seven minutes of the fourth quarter, disallowing any comeback hopes. Trailing 50-41 at the end of three quarters, the Tommies stepped on the gas in the final 10 minutes, eventually closing out the Gusties. The home team shot a 50 percent clip (22-44) from the field, while Gustavus struggled to find consistent shooting as it went 19-55 from the field. Miranda Rice led the balanced offensive output for the Gusties, leading with 11 points. Hannah Howard (Sr., St. Paul, Minn.), Lee, and Miller each added nine. Miller also posted two steals to set a Gustavus program record for most steals in a season with 84, breaking Colleen Ruane’s record of 83 steals set during the 2011-12 season. Howard played in her 100th career game in Black and Gold. Gustavus will find out tomorrow at 1:30 p.m. if it is rewarded a spot in the NCAA Tournament. Watch the NCAA Selection Show webcast HERE.